Directions: To get to Landmannalaugar you have two alternatives when driving on the road no 1 along the South coast of Iceland direction East. #1 - 30km past the town of Selfoss follow road 26 direction North-East for 60km. Road 26 will become F26 (4x4 only) and keep following for another 20km. Follow F208 direction South for another 30km and just before reaching to Landmannnalaugar follow road F224. #2 - 48km past the town of Vik follow road F208 (4x4 only) direction North for 75km and just before reaching to Landmannnalaugar follow road F224. Note: when opting for #2 river crossings are required to reach Landmannalaugar! Landmannalaugar is a place in the Fjallabak Nature Reserve in the highland of Iceland. It is at the edge of Laugahraun lava field that was formed in an eruption around the year 1477. It is known for its natural geothermal hot springs and surrounding landscape. Visiting landmannalaugar with your own (rented) vehicle is most easy in July-August when the F roads are open. I was told it is possible to visit Landmannalaugar before/after this period with travel agencies operating from Reykjavik. Note that due to melting snow (April to Jule) or at times of heavy rainfall river crossings can be a challenge! 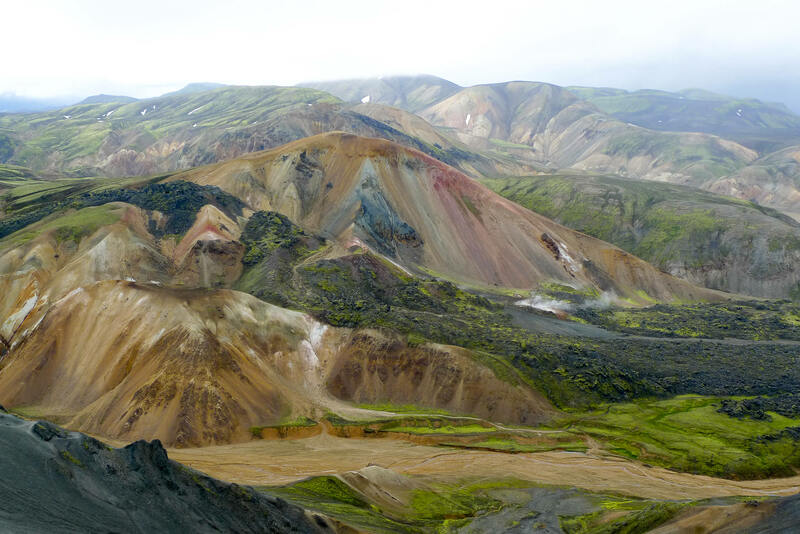 Landmannalaugar is already overwhelming when standing at the bottom of the valley from where you have some nice views on the colorful mountains which have tints of red, purple, blue and green as a result of the volcanic activity in the region. The best way to explore the area is by putting on your walking shoes and following one of the hiking trails which lead you to the top of one of the mountain tops. 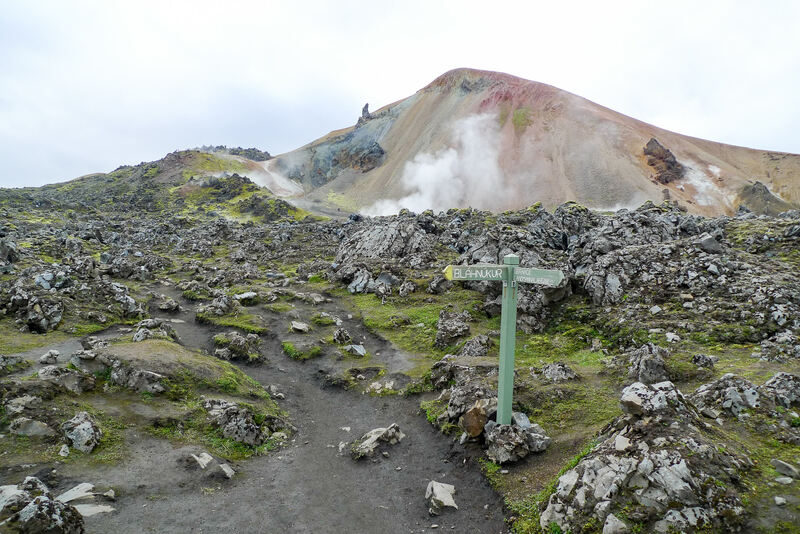 Tip: follow the Bláhnjúkur trail which departs from the Landmannalaugar campground and takes you to the top of the Bláhnjúkur mountain (940m) offering epic views over the Laugahraun lava field and surrounding area. After descending from the mountain you return the the campground through the Laugahraun lava field. Difficulty of this hike is moderate and can be completed in 2 to 3 hours (excluding your time taking pictures). The weather in the highlands of Iceland is very unpredictable: strong winds, rainshowers, sunny skies can easily alternate each other each 15 minutes. Due to the ever changing conditions it is hard to say which time of the day it is best to take your pictures. Due to possible strong wind you’ll want to have a sturdy tripod especially when taking pictures from the mountain tops! Also bring wind- & rainproof clothing and protection for your gear. The roads and surroundings to Landmannalaugar are very rough especially when accessed from the South. Due to the bumpy F roads and river crossing you need to allow at least 3 hours (South, road 1 – F208) to reach Landmannalaugar. Accessed from North allow 2 hours from the end of road 26 to reach Landmannalaugar. When you’d like to spend more than 1 day in Landmannalaugar, the Iceland Touring Association operates a mountain hut with sleeping bag accommodation for 75 people and a public toilet with showers. There is also a small campsite but make sure to bring decent equipment as the weather can get very rough. During the tourist high season there is also a small shop there that sells coffee and basic groceries. Several bus companies operating from Reykjavik have regular trips to and from there during the tourist season.